My best trades are always those stocks that are at the beginning of trend. They are stocks that have recently exploded our of a base, double bottom, trend line break, etc. Many times these stocks will just continue moving up. But, every now and then they will pull back giving me a nice opportunity at my favorite chart set up - the first pull back trade. But how do you find these explosive stocks? The best way to find these stocks is to scan for a wide range candle that closes near the top of the intra day range. But, it depends on where this wide range candle is located on the chart to determine its significance. You have to be able to tell the difference between a wide range candle that ignites a new trend and one that ends a trend (exhaustion move). This stock has exploded through the upper trend line. It has completely erased the previous down trend and has just begun a new up trend. 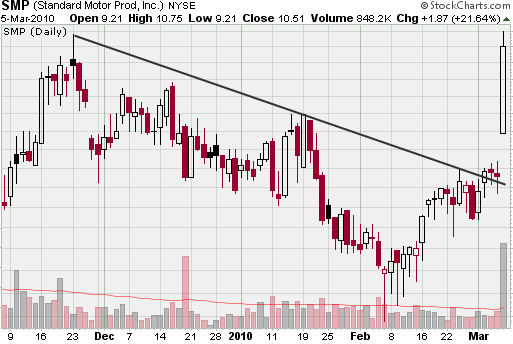 So, this is a stock that I would add to my watch list and wait to see if it sets up a first pull back scenario. This stock has a nice wide range candle (compared to previous candles) but it has happened after an already extended move to the upside. So, I would not trade this stock. The black arrows are wide range candles that have started a new trend. See how they have exploded up through the down trend? So, these are stocks that you would add to your watch list. Then you would just look to buy the first pull back (green, circled). 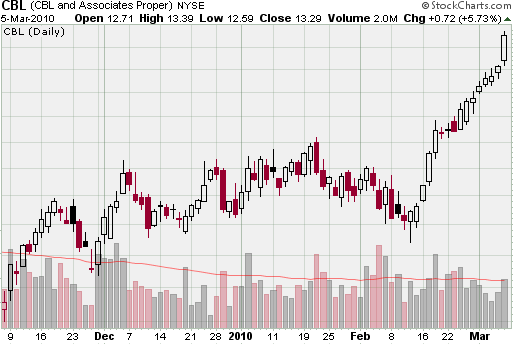 At the top of the chart you will see a good example of an exhaustion move. 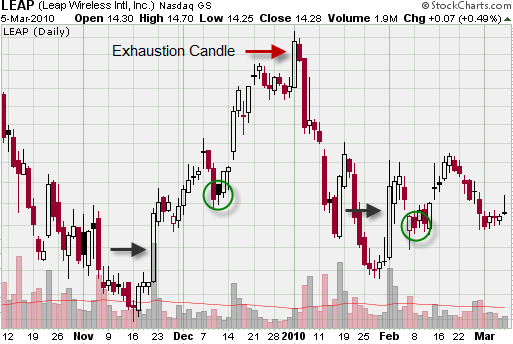 This is a nice wide range candle but it has formed after an already extended move to the upside - not a good time to trade this stock! So, to find these explosive stocks, all you have to do is create a scan that looks for wide range candles that close near the top of the intra day range. Then, you will have to sift through the scan results to find those stocks that are igniting a new trend. It takes some time to find these stocks but it is time well spent!